Stayin’ Alive Tribute Show is one of the best Branson shows to be held at Andy Williams Moon River Theater on September 8, 2018. This tribute show will provide audiences the full songs of Bee Gees such as “Jive Talkin’,” “Night Fever,” “How Deep Is Your Love,” “You Should Be Dancing,” “Nights on Broadway,” and “Staying’ Alive.” In addition, the group will perform softer song ballads such as “I Started a Joke,” “Massachusetts,” “Fanny Be Tender,” “Words,” and “To Love Somebody” among other greatest hits of the Bee Gees. STAYIN' ALIVE is the most definitive production of its kind, offering big screen video clips, photos and dazzling imagery. As a quintessential tribute band to the Bee Gees, the show captivates the excitement of everyone in the audience as they hear the tender subtleties of the human voice in this live performance show. This limited-engagement show features some of the best songs from the beloved singing trio known as one of the world’s best performers. This touring production has entertained audiences all over the world, and it has been seen in many amazing venues such as Disney World, New York, Chicago, Los Angeles, Stockholm, Mexico City, Toronto, and more. Aside from offering a great blend of high-energy songs and slower ballads, this tribute show features all the hits of the Bee Gees to give audiences a truly entertaining production show. 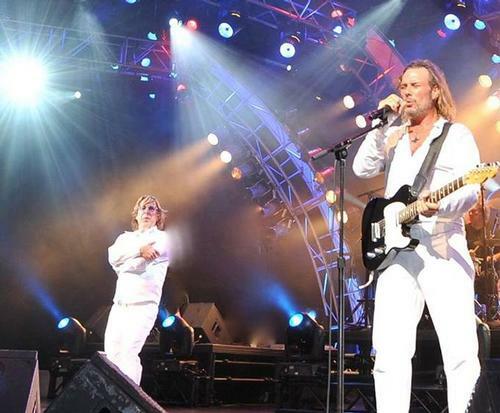 The cast of the tribute show include Tony Mattina as Barry Gibb (Lead and Backing Vocals and Guitar); Todd Sharman as Robin Gibb (Lead and Backing Vocals); Joseph Janisse as Maurice Gibb (Backing Vocals and Keyboard); Smokin’ Joe Peeres on Guitar; Cheryl Hardy as Backing Vocals; Chris Musslin on Bass; and Tom Wolf on Drums. This tribute show reminisces the musical career and history of the Bee Gees, so get inspired by listening and remembering the songs of one of the world’s most famous pop groups of their time. Let this incredible trio bring to life the unforgettable songs of one of the world’s most famous pop music group. Take an emotional journey with the trio as they present to you a prolific, dynamic, and historically significant musical powerhouse. High-energy performances and captivating storytelling are all beautifully presented in one Branson show. The success of the Bee Gees on the contemporary charts in the ‘80s and ‘90s are remembered, not to mention their significant contributions to some of the world’s greatest recording artists. As the three brothers Barry, Robin, and Maurice helped shape the face of music in their time, their songs have topped the charts around the world and have been patronized by some of the world’s top artists. From ballads to disco hits, their music crossed genres from pop to disco and influenced generations of fans and countless musicians from around the world. The Bee Gees have produced more than 200 albums with countless songs that hit the music charts. Stayin’ Alive Tribute Show at Andy Williams Moon River Theater is one of the most anticipated Branson shows this fall.